Odate Homei Senior High School (Homei) is located in Odate City in the northern part of Akita Prefecture. Founded in 1898, Homei produces excellent graduates who play active roles in various parts of both local and global society. 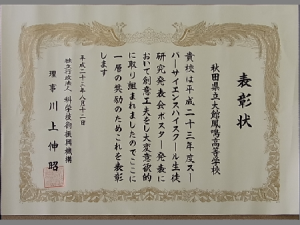 Our school is blessed with top students from the northern parts of Akita who study hard to meet the high standards set by our school. Homei has about 780 students divided amongst three grades and 20 classes. In their second year, students choose their courses according to their individual career goals. For both second and third year students, two course tracks are available. 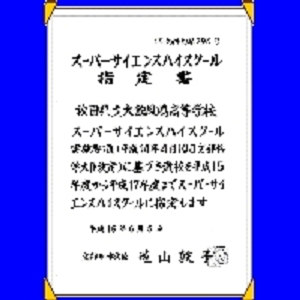 One class is designated for the Science-Mathematics Stream, while the five remaining classes are the General Stream. The General Stream is divided into two sub-streams: Humanities and Science. The students in the Science-Mathematics Stream have a deep interest in these subjects and aim to enter university to further study in fields such as science, technology and medicine. 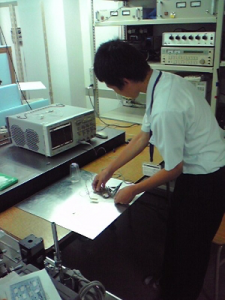 Along with standard high school subjects, students focus on science and mathematics and conduct independent research projects. Their research activities are highly praised both locally and nationwide. Student research includes such topics as bio-ethanol production from rice straw, the aerodynamics of a boomerang, and the genetic characteristics of people in Akita. 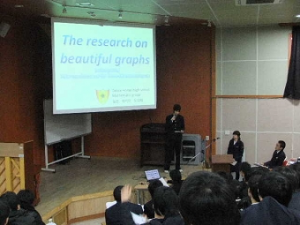 A few years ago, one of these research projects was awarded first prize at the National High School Science Conference. 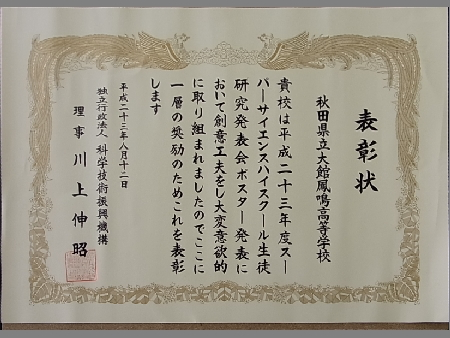 In 2008, Homei was once again designated as a Super Science High School (SSH) by the Ministry of Education, Culture, Sports, Science and Technology (MEXT), after a five year long designation process. With the financial assistance granted from SSH designation, Homei invites many professors and researchers from various universities and companies to present lectures to students. Students are also given the opportunity to visit universities and institutions to broaden their perspectives of scientific fields. During these visits in the past, students have received advice on their own research from authorities in their respective fields. As an SSH, many advanced scientific instruments have been provided to the school, such as a spectrophotometer, centrifuge, clean bench, autoclave, and high-speed camera. 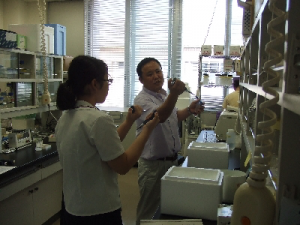 These instruments have greatly improved the quality of the students’ research and education. 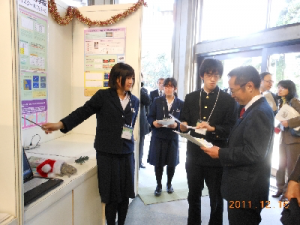 Student research includes such topics as bio-ethanol production from rice straw, the aerodynamics of a boomerang, and the genetic characteristics of people in Akita. 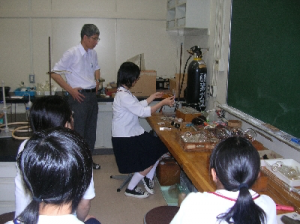 Three years ago, a professor with a Ph.D. in Molecular Biology from Tokyo University was employed at our school to help students with their critical thinking. His area of expertise is in genomics, and he has helped to guide our students through the wonders of the genomic field. 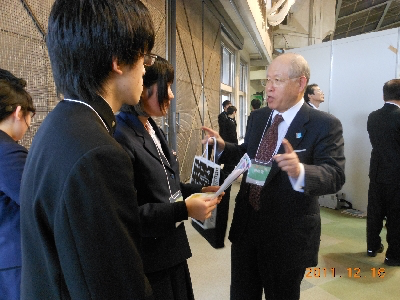 With the students, he has conducted experiments such as the DNA analysis of living cells. He also obtained some tissue samples of a coelacanth from Tokyo University and along with students analyzed its DNA. This student project was awarded one of the top nine research projects in the Japan National High School Science Conference. Our school puts both an emphasis on academic study and club activities, encouraging students to aim high in both. After school, many students engage in club activities, allowing them to train their bodies as well as their minds. Some clubs, such as track and field, volleyball, swimming and soft tennis, have taken part in the All Japan Inter-High School Athletic Meet. Last year, our baseball team advanced to the national meet held in Koshien Stadium for the first time since the schools opening in 1898. 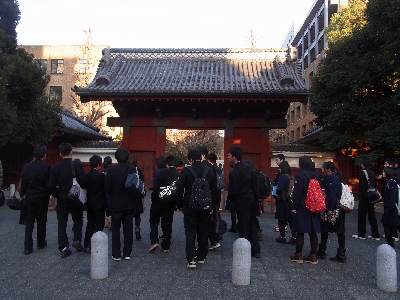 Homei’s cultural clubs, such as art club and photography club, are often chosen to exhibit their works at the National High School Exhibition. 1. To foster a spirit of autonomy, which is the foundation for life-long learning. 2. To enhance respect for life and human rights and promote peaceful co-existence with others. 3. To foster a positive attitude toward learning. 1. To establish a learning system to aid students in deciding their future careers. 2. To encourage participation in student council activities and club activities. 3. To enhance student morality and encourage desirable habits in their lives. 4. To strengthen cooperation with parents and the local community. (2) Show special talent in his or her club activity. The applicant must hand in extra documents to certify his or her ability. Applicants take part in an interview, which includes some academic questions. 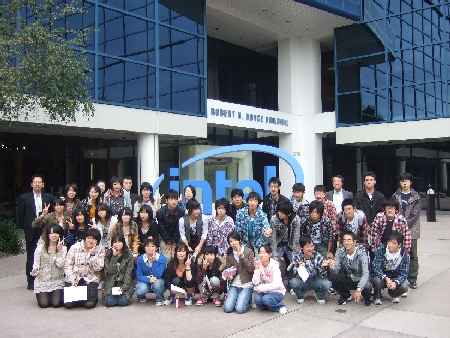 Applicants take an entrance examination composed of five subjects (Japanese, Social Studies, Mathematics, Science and English). 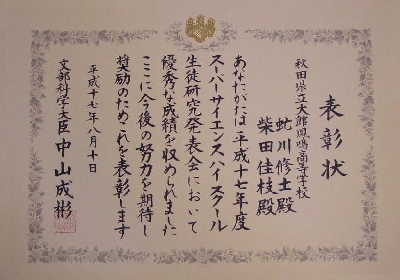 Students must demonstrate high academic ability on the examination, as well as have achieved high academic grades in their junior high school subjects. Primarily aiming to find the relationship between population and species of tardigrades and moss or lichen which they inhabit, this distribution research was done in schoolyard of Oodate Houmei high school. The aim could not be achieved, but it could be concluded that the circumstance which is easy to dry would be relatively advantageous for them because there are little competitors or enemies. 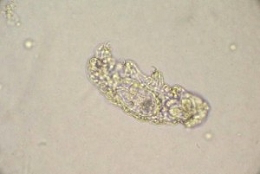 And tardigrades which are observed at this research were identified as belonging to Macrobiotus. Moreover other 4 species of tardigrades which are observed in other places were identified as belonging to Echiniscidae, Hypsibius, order Parachela, and Milnesium Tardigradum. 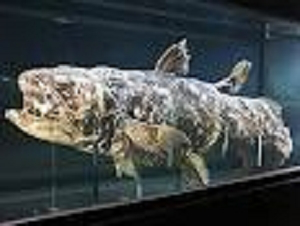 Coelacanths are known as a “living fossil”. In order to clarify why their form has not changed since at least four billion years ago, we determined the DNA sequences of the mitochondrial genome and compared them with the corresponded sequences of several organisms on NCBI database. The results might imply that a nucleotide substitution rate of their mitochondrial genome was smaller than that of other organisms.